We’ve all heard of ‘healthy’ cakes that are sugar-free, gluten-free, dairy-free, nut-free, fun-free etc. But let’s be real, they’re not as healthy as a bowl of salad. Or are they? Misuki Moriyasu, a Japanese food stylist and designer, seems to have found the answer to all our prayers…or at least mine. 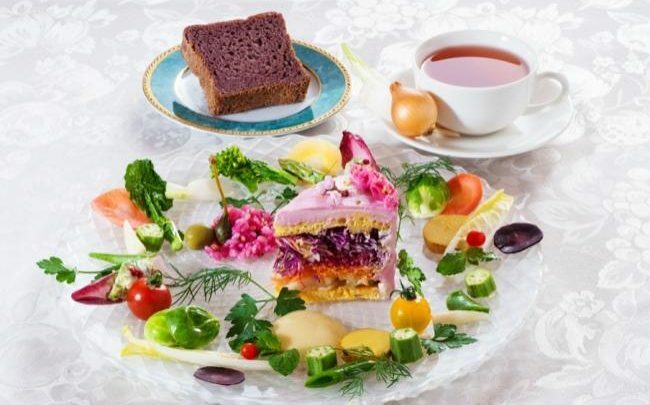 To make vegetables more palatable at her café Vegedeco, Moriyasu created salad cakes that look like desserts but consist of veggies! To make them, she blends whole vegetables with soybean flour to replace regular flour and uses cream cheese or tofu to replace the icing. The end result is a spongey masterpiece that won’t satisfy your sweet tooth, but will definitely fool your brain to think that it is!